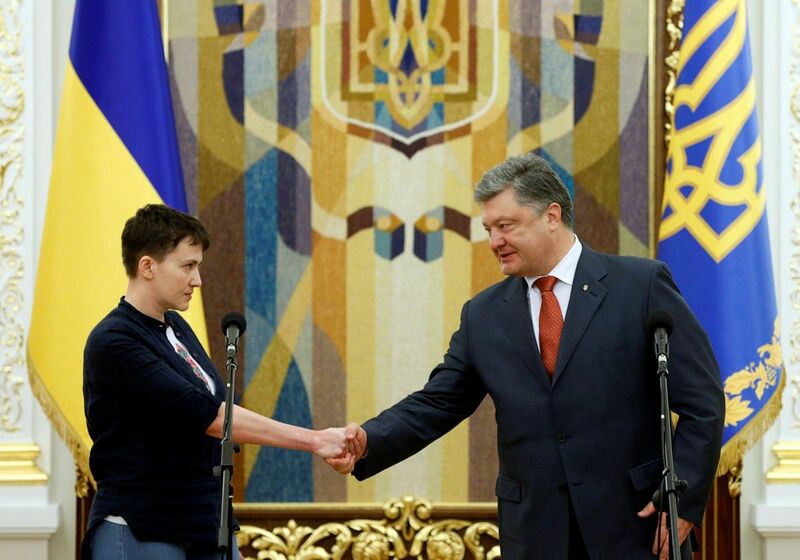 Ukrainian President Petro Poroshenko has handed over the Order of the Gold Star of the Hero of Ukraine to Ukrainian pilot, Member of Parliament, member of Ukraine's delegation to the Parliamentary Assembly of the Council of Europe Savchenko, according to an UNIAN correspondent. "Nadiya Savchenko has been assigned the title of the Hero of Ukraine being simultaneously presented with the Order of the Gold Star for an unbroken will, civic courage and sacrificial service to the Ukrainian people," reads a presidential order, which was read out by deputy head of the Presidential Administration Andriy Taran at the Administration's building on Wednesday evening. Poroshenko said that Savchenko was the first female soldier who received that award and title. Poroshenko signed his order on the award on March 2, 2015. "I serve to the people of Ukraine," she answered while accepting the award. Read also"Trust me, I'm not afraid of anything": Savchenko first spoke on Ukrainian soil freed from Russian captivity (photo)Savchenko was swapped for two Russian GRU special forces officers Yevgeny Yerofeyev and Alexander Alexandrov, who flew to Moscow on the same day when Savchenko returned home on May 25, 2016. Addressing journalists upon arrival, Savchenko said she was ready to die for Ukraine. Read alsoSavchenko tells Russians to get off knees"I am ready to give my life on the battlefield for Ukraine, and I will do my best each child who is captive would be freed. No heroes of Ukraine should die. It's very convenient when the heroes are dead, it's inconvenient when they are alive. But we will live. The heroes will be in Ukraine's parliament, to the envy of the Russian Duma. We will have those are worthy to be there in our parliament," she said.